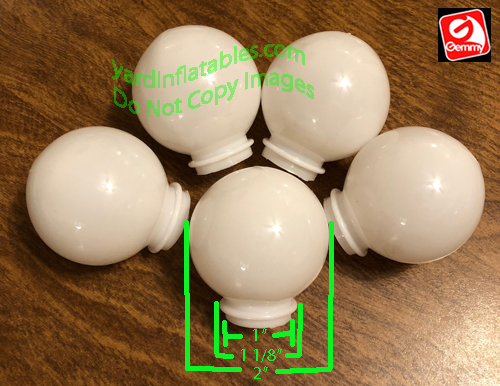 Set of 5 Medium, Gemmy 2" Plastic Light Bulb Cover/ Globes! These Light Bulb Covers are used on some of Gemmy's indoor color changing Christmas trees that played songs and had a microphone, along with numerous other items. These are NOT for Inflatables!!! The dimensions are listed on the picture! Make sure yours are the same, because there are no returns on this item! Buy it NOW! Discontinued item. Very Limited Quantities!